Society has entered the era of the versatile and powerful sportswatch allowing users to keep up-to-date on teams, players and topics from wherever they are via Bleacher Report. Smartphones are starting to become the size of tablets yet most technologies are being microsized so it makes sense to offer a wrist watch that functions nearly exactly like the iPhone, iPad or even a Mac complete with a fitness tracker, all in the size of a silver dollar. 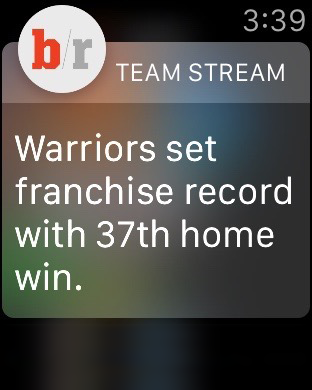 So you see after watching the video, if you attend a kid’s practice, take in a professional game in person or even hike on your favorite trail with the family dog, you can also engage with exactly the kind of sports content you want via the combination of the Apple Watch and free Team Stream App. “Team Stream is the leader in providing fans with the real-time information and immersive experiences tied to their favorite sports, teams and players,” said Dorth Raphaely, general manager, Bleacher Report.  Follow Games At A Glance With Live Play-by-Play – By tapping on any individual game, fans can view both the score and live play-by-play details. 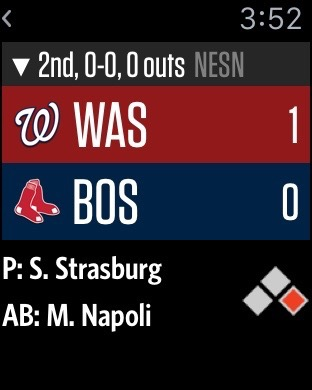 I enjoy getting Team Stream text and video push notifications about stuff I want to know more about via news breaks. Sports Techie, the next time your Apple Watch tells you to stand UP as part of a fitness and health program whether you are in the office, at a venue or exercising, why not also open up the Team Stream App and browse over current headlines, watch the best highlights while analyzing the perspective of writers and contributors on compelling or trending stories. Follow the NBA and NHL playoffs, MLB games, Premier League, UEFA Champions League and MLS soccer matches, NASCAR and horse races, MMA, UFC and boxing events, and the upcoming NFL draft with the Watch and Team Stream. My gratitude goes to management team at Turner Sports for sharing this information with us. The Watch is here and so is the Bleacher Report App.